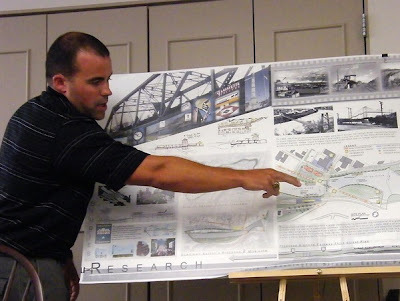 Easton, PA - Nathan Nace, W2A Project Designer and recent Drexel University graduate, presented his Bachelor of Architecture thesis to City of Easton officials, on Wednesday night. His thesis involved a Master Plan for the revitalization of Easton's South Third St. and Washington St. intersection. Mr. Nace has been employed by W2A for nearly five years, and provides the following services for W2A projects: schematic and diagrammatic sketches, calculations, 3–D renderings, perspective views, drafting of construction documents and project management support.